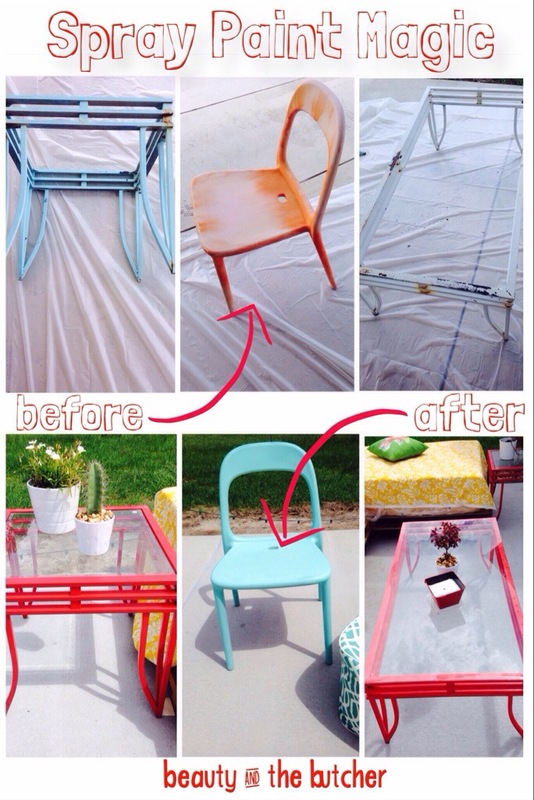 As you know, we recently got our patio poured so I’ve been “upcycling” some outdoor furniture to adorn it! The orangish chair is several years old from IKEA and the wrought iron (side note: for the better part of my life I thought it was “rod iron”. I mean think about it, doesn’t that just make more sense?!) side table and coffee table I got for FREE on the side of the road, a neighbor was getting rid of them, glass in tact and everything! Don’t be scared of yucky rusty furniture, outdoor spray paint these days is full of primers and rust repellents and all you need is a sturdy wire brush to clean it up! A few cans of spray paint later and I have some brand new looking patio furniture that compliments my red,yellow, and turquoise color scheme perfectly! « Puppies love coconut oil too! Thanks so much! You can do it, don’t be afraid! Thanks for providing the information regarding the some outdoor furniture service. So this are information that’s really very helpful for me.